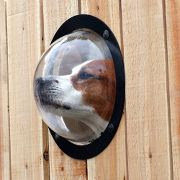 On the extreme end of the pet pampering continuum, we have this porthole enabling your pooch to keep tabs on that evil cat next door. From Hammacher Schlemmer (of course! ).